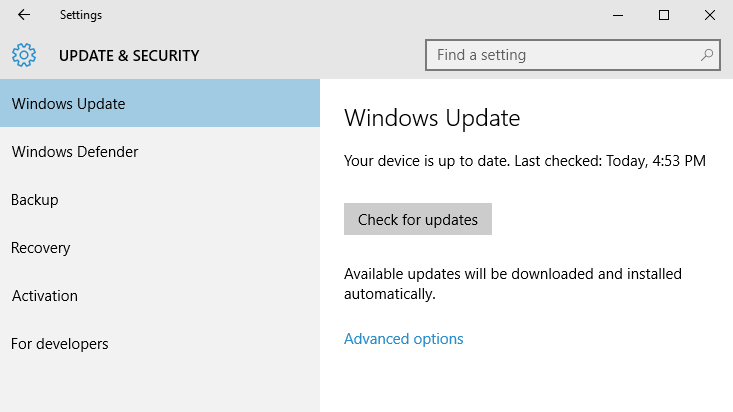 Windows 10 introduces the ability to download Windows updates and apps from more than one place, that’s from other PCs in addition to Microsoft’s servers. In layman term, Windows 10 is using peer-to-peer (P2P) technology such as those of BitTorrent to share the burden of resources used to distributes updates and apps to billions of Windows devices around the world, especially in term of network bandwidth. While enabling the option to download updates from more than one place can be useful to ensure speedier download speed, but with all P2P implementation, your Windows PC or device will also be part of peer-to-peer network of nodes that send parts of previously downloaded Windows updates and apps to PCs on your local network, or PCs on the Internet. In other words, in Windows 10 P2P, you’re a downloader, as well as an uploader. Typically, Windows updates and apps are delivered directly from Microsoft servers to end user’s computers. P2P delivery method may not be favored by all people, such as users who are in broadband connection that has limited bandwidth, or on slow Internet connection, or for users in enterprises and corporations which may use other management solutions to perform the patching, such as System Center Configuration Manager, Windows Server Update Services (WSUS) or Windows Update for Business. By default, P2P update downloading is turned on by default. The tutorial below will guide you on how to turn off the P2P downloading so that updates and apps are only coming from one place, that’s Microsoft, or computers within the same local network. Click or tap Advanced options. Click or tap Choose how updates are delivered. 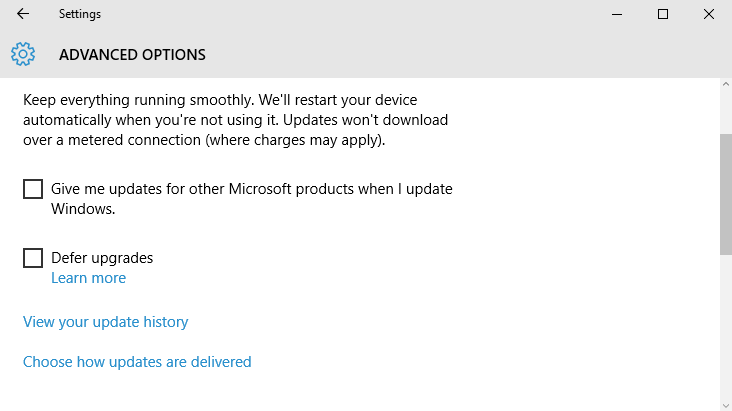 To turn off P2P delivery method so that Windows updates and apps are only downloaded from Microsoft, toggle the switch for Updates from more than one place to Off. 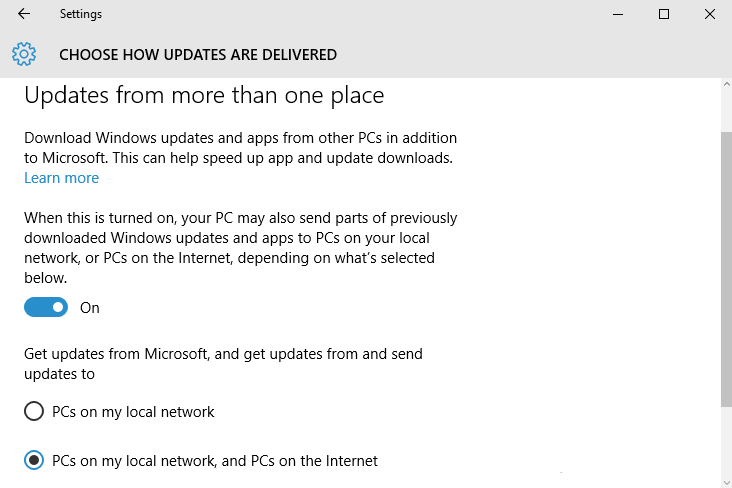 To turn on P2P delivery method so that computer can get Windows updates and apps from Microsoft, and get updates from and send updates to PCs on local network only, but not the Internet: Set Updates from more than one place switch to On, and choose the radio button of PCs on my local network. The change takes effect immediately. Close the Settings app if you like. Well, if you’re facing slow download speed in Windows Update and have P2P delivery method disabled, you can try to turn it on again. 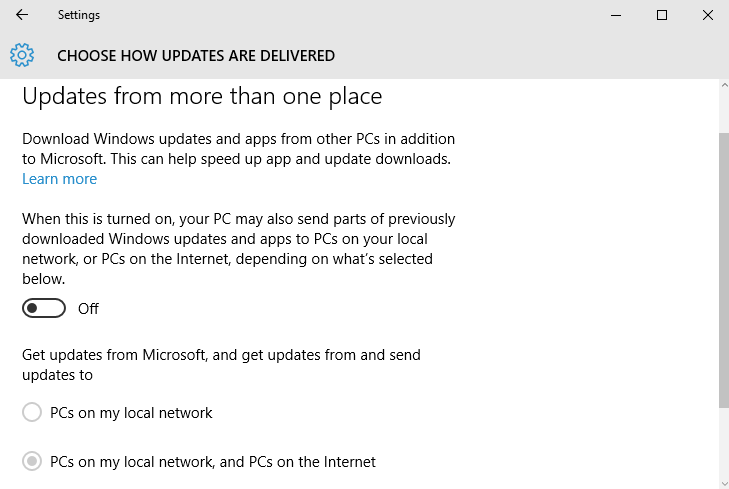 To turn on P2P delivery method so that computer can get Windows updates and apps from Microsoft, and get updates from and send updates to PCs on local network and PCs on the Internet, toggle the switch for Updates from more than one place to On, and choose the radio button of PCs on my local network, and PCs on the Internet.